On Thursday evening, U.S. President Donald J. Trump announced that Jim Mattis, his inaugural secretary of defense, would be retiring in early 2019. A resignation letter by Mattis released shortly after Trump’s announcement clarified that he was effectively leaving the administration due to considerable ideological disagreements with the president. “The end date for my tenure is February 28, 2019, a date that should allow sufficient time for a successor to be nominated and confirmed,” Mattis noted in his resignation letter. “A new Secretary of Defense will be named shortly,” Trump noted on Twitter, shortly before Mattis’ resignation letter was released. Mattis’ resignation will come as a blow to many U.S. allies and partners in the Asia-Pacific who saw him as a symbol of continuity in U.S. defense and security policy in the Asia-Pacific. In 2017 and 2018, Mattis traveled multiple times to capitals in allied, partner, and adversarial Asian states alike and developed relationships with multiple counterparts. 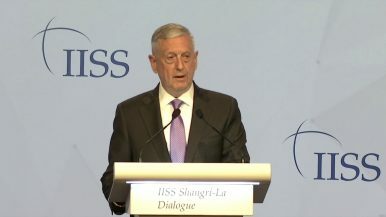 Across both years, Mattis represented the United States at the Shangri-La Dialogue in Singapore, offering a high-level statement of the Trump administration’s Asia policy. He oversaw the development of the 2018 National Defense Strategy and had input on the Trump administration’s Nuclear Posture Review and National Security Strategy. Mattis’ resignation letter, however, suggests that he and the U.S. president differ on many of the issues emphasized in the National Security Strategy and National Defense Strategy documents, including the importance of U.S. alliances in Asia and the primacy of great power competition for the Trump administration. It’s unclear, moreover, what exactly may have been the proximal cause for Mattis’ resignation, but his departure was announced one day after the Trump administration announced a withdrawal of U.S. forces from Syria, seemingly without interagency consultation prior. Before becoming secretary of defense, Mattis, a retired Marine Corps general, had served in the first and second Gulf Wars and the war in Afghanistan. Mattis went on to command U.S. Central Command. Following George C. Marshall, U.S. secretary of defense from 1950 to 1951, Mattis became the second-ever nominated secretary of defense to receive a waiver under the U.S. National Security Act of 1947 allowing him to transition from active duty military to a civilian cabinet position without waiting for the requisite seven year period between the two roles specified by the act.